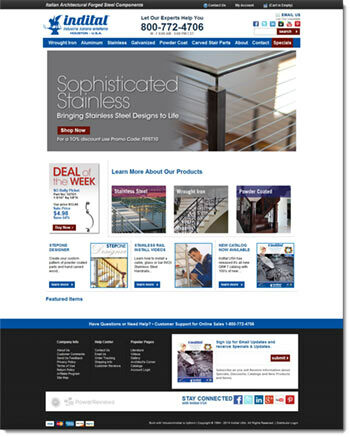 Indital USA is a wrought iron parts shop offering iron gates, wrought iron fencing, and decorative railings using classic techniques. With over 30,000 unique architectural metal components made of wrought iron, stainless steel, and aluminum, Indital USA draws off the many years of experience from its parent company located in Italy. Today, Indital USA embraces that same reverence for architectural focal points established years ago simply with some fire, an anvil, and a hammer. As a family business steeped in tradition and passion, the company started to expand into other European countries soon after its start. It was only natural that United States would be on the horizon. It started with a few containers of balusters and decorative bar products with a select customer base that led to a joint venture in 1994 in Houston, TX for faster distribution.